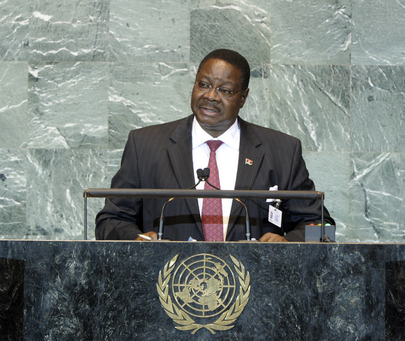 ARTHUR PETER MUTHARIKA, Minister of Foreign Affairs and International Cooperation of Malawi, said that, in today’s increasingly complex world, it was no longer possible to solve issues with an inward focus alone. The role of mediation in the settlement of disputes, therefore, could not be overemphasized. He applauded the efforts of the United Nations, the African Union, regional economic organizations and other international organizations for the role that they played in the settlement of disputes. Malawi had also worked towards curbing youth unemployment and rapid urban migration by introducing a series of national initiatives, including the Malawi Rural Development Fund, the Youth Enterprise Development Fund and the One Village One Product scheme. It had made strides in areas such as combating HIV/AIDS and malaria, and had reduced its under-five mortality rate from 189 deaths per 1,000 in 2000 to 112 deaths per 1,000 in 2010. However, challenges remained. The current crises, coupled with natural calamities, most affected the world’s least developed countries, of which Malawi was a part. In that regard, he expressed his hope that the commitments made at the Istanbul Programme of Action in May 2011 would be fully implemented. Additionally, as Malawi, like other African nations, was adversely affected by climate change and global warming, he hoped that the upcoming Conference of States Parties to the Climate Change Convention would conclude in a positive agreement based on the Bali Plan of Action, with agreed cuts on greenhouse gas emissions and measures adopted to help ameliorate the impacts of climate change on the most vulnerable nations. With regards to peace and security, he called on the General Assembly’s Member States to redouble their efforts to eliminate current conflicts, prevent the occurrence of new ones, and continue to condemn, frustrate and isolate those who sought to come to power through corrupt and unconstitutional means. Malawi would continue to play an active role through the contribution of troops to United Nations peacekeeping operations. Recalling that colonialism ran counter to social, economic and cultural development — and that there remained 16 Non-Self-Governing territories around the world — he further urged the United Nations to renew its commitment to ensuring that those territories were able to exercise their right to self-determination. Finally, he expressed concern at the “slow pace” at which the reform of the Security Council was progressing. More than 15 years had passed since the process began, he recalled, and there appeared to be no tangible progress. “We in Africa are desperate to see that the historic injustice done to our continent at the inception of the United Nations is addressed as soon as possible,” he stressed, by granting Africa two permanent seats with all the privileges and prerogatives as the current permanent members enjoyed, including the right to veto if that function were maintained, and a total of five elected seats. That position was stipulated in the Ezulwini Consensus, he added, which clearly provided a solution to the long-awaited reform of the Council.